Hanhaa announced that it is starting to deploy its ParceLive service with its first logistics partners. PriceLive is designed to be used as a tracking device for high-value, fragile, and time- or temperature-sensitive packages. 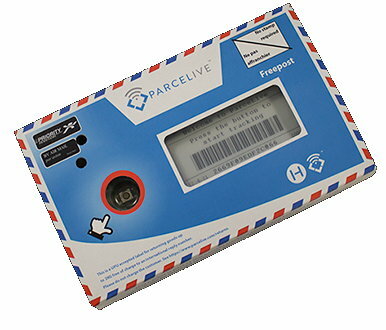 The ParceLive tracker is a mobile-connected device that is inserted in the parcel and then provides real-time information on the location, condition and security of the shipment. It uses a small E Ink display which displays an international returns license. 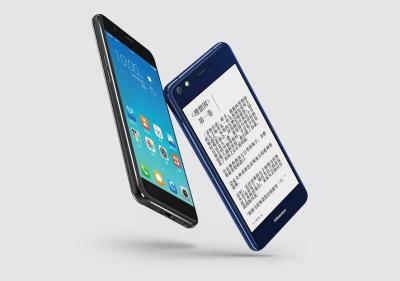 The Hisense A2 Pro is a dual-display Android smartphone that features a 5.2-inch 960x540 E Ink display on the back. The front (and main) display is a 5.5-inch FHD OLED display. Other features include an octa-core Qualcomm Snapdragon 625 chipset, 4GB of RAM, 64 GB of storage, microSD slot, 12 MP camera and Dual-SIM. The Hisense A2 Pro will launch soon in China, pricing information is not available yet. 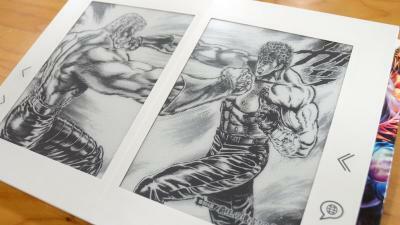 The eOneBook is a dual-screen Manga comics e-reader. It features two 7.28-inch E Ink displays with a paper case designed to look and feel like a paperback comic book. The eOneBook is limited to a single Manga series (Fist of the North Star) which comes pre-loaded and cannot be updated or changed. The eOneBook is expected to ship by April 2018 in Japan for 37,800 yen (around $330 USD). The project launched with a successful crowdfunding campaign, already raising almost 20 million yen in a few days. E Ink Holdings and Plastic Logic have renewed their Master Supply Agreement (MSA). This agreement centers around flexible e-paper production and the two companies hope that this will strengthen their collaboration and help accelerate market adoption for flexible e-paper displays. Plastic Logic has been working with E Ink for over 10 years, applying PL's OTFT technology to E Ink's displays. Dasung's 2nd-gen E Ink monitor, the Paperlike Pro, uses a 13.3" monochrome Carta E Ink display with a 1600x1200 resolution. It includes an HDMI input. Dasung promises that the refresh rate will be almost equal to an LCD. Dasung has launched a crowdfunding campaign for the PaperLike Pro. It is also available via Amazon.com globally for is $1,399. The San Diego airport new rental car center building installed the world's largest e-paper installation called Dazzle. Design team Ueberall International used more then 2,000 solar-powered E Ink Prism tiles to create Dazzle. The art program manager at the San Diego Airport says that this installation will be viewed daily by hundreds of thousands of airport visitors and motorists on the nearby Interstate 5 freeway. This is an example of a sustainable, programmable and exciting new art installation. The entire installation had a budget of $875,000, which is about $437 per panel, but of course the price of each panel also includes the wireless communication devices, solar panels, software and more.